Doing Well and Doing Good? Growing interest in the impact of fossil fuels on the global climate may spark questions about whether individuals can integrate their values around sustainability with their investment goals and, if so, how. As citizens, individuals can express their political preferences around sustainability through the ballot box. As investors, they also can express their preferences through participation in global capital markets. One key question these investors face is how to do this without compromising their desired investment outcomes. For instance, how can they reduce their portfolio’s environmental footprint while maintaining sound investment principles and achieving their investment objectives? Sustainability preferences are not generally restricted to greenhouse gas emissions. Many investors may also have concerns about land use and biodiversity, toxic spills and releases, operational waste and water management, among other issues. Thus, it is a challenge to achieve the dual goal of efficiently considering sustainability preferences while building investment solutions that help meet investors’ financial goals. One way to approach this challenge is to focus first on developing an investment methodology that emphasises what research indicates are reliable sources of higher expected returns while also aiming to minimise unnecessary turnover and trading costs. For instance, this may mean starting with a broad universe of stocks ranging from very large companies to very small companies, and then systematically pursuing higher expected returns by increasing the weights of those securities with smaller market capitalisations, lower relative prices and higher profitability. Next, investors can evaluate those companies being considered for investment using a focused set of environmental issues that reflect their primary concerns. 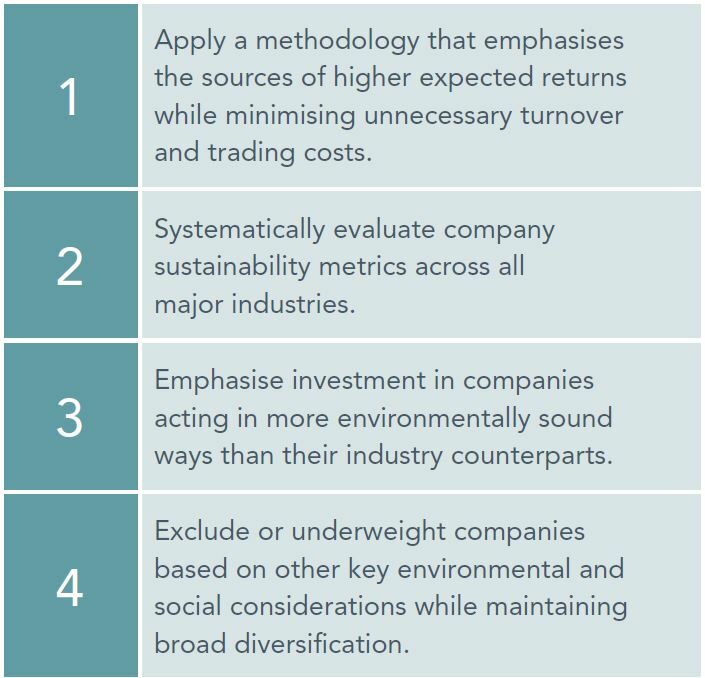 By using a holistic scoring system, rather than a completely binary “in” or “out” screening process, investors may be able to preserve diversification while recognising those companies with positive environmental profiles. This involves looking at companies across the entirety of a portfolio and within individual sectors with the goal of incorporating sustainability preferences while also maintaining the characteristics of the original strategy. For example, if one is trying to reduce a portfolio’s greenhouse gas emissions and potential emissions from fossil fuel reserves, the worst offenders across all industries may first be deemphasised or excluded from the portfolio altogether. Next, companies may also be rated on sustainability considerations within each industry. For example, this could include retail companies that improve the energy efficiency of their facilities, utilities that produce electricity using solar or wind power, transportation companies that improve the fuel efficiency of their fleets or use alternative-fuel vehicles or energy companies that increase efficiency, reduce waste and improve their overall environmental footprint. On the other hand, companies with poor environmental sustainability ratings relative to industry peers may receive a lesser weight or may be excluded. Using such a combination of company selection and weighting may allow for substantial reduction in exposure to greenhouse gas emissions and potential emissions from fossil fuel reserves—important goals for many investors—while providing a robust investment strategy that is broadly diversified and focused on the drivers of expected returns. The key takeaway for investors is that investing well and incorporating values around sustainability need not be mutually exclusive. 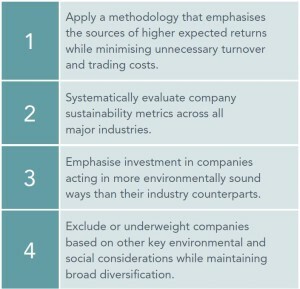 By starting with a robust investment framework, then overlaying the considerations that represent the views of sustainability-minded investors, this allows for a cost-effective approach that provides investors the ability to pursue their sustainability goals without compromising on sound investment principles or accepting lower expected returns. The content of this article is for general information purposes only. It does not constitute tax or investment advice as it does not take into account the investment objectives, knowledge and experience or financial situation of any particular person or persons. You are advised to obtain professional tax and investment advice suitable to your own individual circumstances. Ardbrack Financial Limited makes no representations as to the accuracy; validity or completeness of the information contained herein and will not be held liable for any errors or omissions. Investments involve risks. The investment return and principal value of an investment may fluctuate so that an investor’s shares, when redeemed, may be worth more or less than their original value. Past performance is not a guarantee of future results. There is no guarantee strategies will be successful. Diversification neither assures a profit nor guarantees against loss in a declining market. Environmental and social screens may limit investment opportunities. Small cap securities are subject to greater volatility than those in other asset categories.